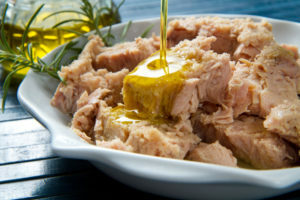 Tuna is one of the most consumed and known foods, especially if it is associated with processed tuna, canned or threaded. The Yellowfin tuna (Thunnus albacares) is the most used for the canned variant and it is also among the finest. Based on its species and classification, we find the tuna fish mainly in the Pacific, Atlantic, Indian and Mediterranean oceans. It does prefer living in school and in the areas where the water temperature does not fall below 10 ° C. The yellowfin tuna is among the most popular species, together with the white tuna it belongs to the Scombridae family, but it is differentiated by the area of origin and the fishing methods. The yellowfin tuna is called in this way for the characteristic yellow color of the dorsal and ventral fins, it has pink flesh and darker streaks, it lives in schools in tropical or subtropical waters, besides in Europe it is possible to find it only off the Portuguese coast. It is a pelagic and highly migratory species, given its reproductive needs during the summer. Its average weight is around 40 kilograms, however it can reach a maximum weight of two quintals and two meters in length. The fishing of this tuna is not connected to a specific period, but it takes place throughout the whole year. Besides the ships used for the fishing are equipped with cold storages, which allow the conservation, thus maintaining the organoleptic characteristics of the fish, until the return to the ground. According to the data of the ANTI (National Association of the Fish Canning industry), the yellowfin tuna, together with the striped tuna, makes up 90% of the raw material for the entire world’s canning industry. In the vast majority of cases, tuna is not consumed in the place where it is caught, but it is frozen, processed and sold; precisely because of these steps, the consumption of tuna increases the ecological impact on the environment of this activity. In this regard, it is essential to pay attention to the most pulled fishing areas, as indicated by the FAO, such as the North-East Atlantic Ocean and the North-Eastern Pacific Ocean, indicated respectively with the areas of Fao 27, 61 and 67. However, thanks to the campaign ‘tuna in the trap’ of Greenpeace and the pressure made by consumers to get more information and transparency on the product, the major Italian brands have entered the information necessary to know the Fao fishing area directly on the package or by entering the code on the box in a search engine site. “Fortunately, most of the tuna fished and canned for the Italian market comes from the Indian Ocean and Pacific Southern Central, but this does not mean that the consumer does not have to check the label when buying the product and they should prefer companies that focus on transparency. Furthermore, it is also really important to enquire into the fishing methods, often unsustainable, which could ruin the marine ecosystem; lately the fishermen tried to resolve the problem by adopting the encircling nets, a system that allows you to fish only tuna with a very low probability of catching other species. 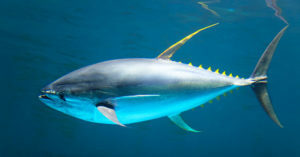 The issue became more evident after the intense exploitation of the bluefin tuna stocks to which it followed a significant increase in the fishing of the yellowfin species. Due to the excessive exploitation and the years of mismanagement of the fishery, the yellow fin tuna is now on the red list of Greenpeace. Therefore, the commitment of producers in terms of ethical and sustainable behavior is significant and indispensable, but the consumer should contribute as well, gaining awareness in the choice of the product, obviously dictated by a correct and clear information.